It was an pleasure working on this installation via Meld Media where I was the Technical Lead and User Experience Designer. 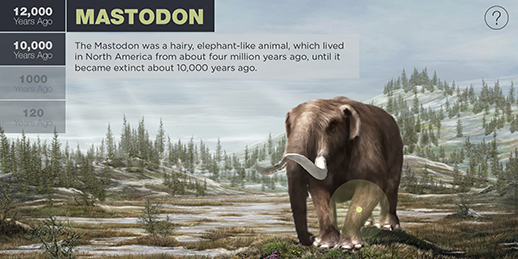 The Mastodon augmented reality exhibit at the Waterloo Earth Sciences Museum transports museum patrons through time allowing them to observe the fossilization and discovery of a mastodon skeleton through history. The app uses the device camera to detect the mastodon mural on the second floor of the museum and projects an augmented reality experience on the device screen.